Shoes, safety, drums, dignity, daughters, sons. Synopsis: Intended for older children, this is not a storybook, but rather a collection of poems that evoke the experiences of slaves in the Deep South. Each poem’s title is that of a quilt pattern, and each has ten lines of ten syllables each, imitating the square shape of a quilt block. Quoting the author from the introduction to the book, “Each poem … reflects a metaphorical patchwork of circumstances encountered by enslaved people in America” and “To reflect the three layers of a quilt, I’ve engaged three references in each poem: a biblical or spiritual reference, a musical reference, and a sewing or fiber arts reference.” Each page includes some factual matter, and each facing page is an illustration that incorporates the quilt pattern and builds on the words of the poem. You may read more about the author’s reasons for writing this book, and how she wrote it, in this blog post on the publisher’s website. There is a difference of opinion on whether or not quilts were used as a kind of code to help escaping slaves. This idea could be introduced to children as something that might have happened, rather than being a certain fact, but it would add an extra dimension to the reading and discussion of this book. There are many possible art projects that could enhance the experience of this book, recreating the quilt patterns using cut construction paper, colored modeling clay, scraps of fabric glued onto a paper backdrop, or children could be shown how to do basic quilting. Nickleodeon’s Parents Connect website has a simple Underground Railroad quilt project. A tie-in to writing would be to challenge children to try to write their own unrhymed poems with ten lines of ten syllables each, or more simply, to imagine what it would be like to be a slave and to write a poem in any form expressing those thoughts. To explore how quilts may have been used as codes, there is a lesson plan from Citizenship and Immigration Canada about quilt codes. There are many links to quilt-related lesson plans compiled on this page by the Drexel company. These lesson plans cover not only history and art, but even geometry and other subjects. A Litte Weekend Liebster Fun! This book sounds wonderful, Beth. The act of quilting is such a personal one–I can see how it ties in well with the poetry genre. Thanks, Wendy. Yes, quilting ties in well with both the genre and the topic. I can’t even begin to fathom the depth of research it took to ensure the balance of stitching the poems together with that level of intricacy. Sounds like both a beautiful and educational read. Love that “stitching the poems together” — your comments are always so lyrical, Angela! And you are so right. This book sounds amazing, and reminiscent of another one of my favorites – Show Way by Jacqueline Woodson. Thanks for sharing! Oh, I’ve seen Show Way — thanks, Julie! What a creative and beautiful way to present these poems. This sounds like a super anthology and resource for Black History month, Beth. I’ve been eagerly waiting to share this book since I bought it in St. Paul, MN last November! I knew I wanted to fit it in during Black History Month. Thanks, Joanna. Wow, a quilt as a code is amazing! It sounds like something from the bunkers. I went into Churchills bunker under Dover Castle it is extraordinary. I don’t know why I’ve linked the two, but being clever and deploying sneaky tactics has saved a lot of lives. Have you been to the Churchill War Rooms in London, as well? I would love to go there, and now you’ve added to my list! I first learned about the quilt codes in a Jennifer Chiaverini novel — her novels are all about quilting. Good reads! Beth, great choice today. This book is unique and sounds like a gem. 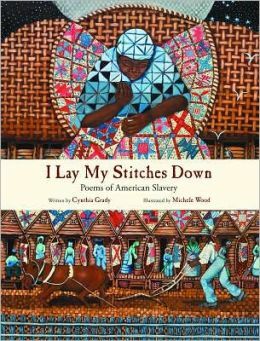 In the many books I’ve read about slavery and the Underground Railroad, I have come to appreciate the role quilts played in saving the lives of slaves and guiding them to freedom. Thank you for sharing. Thanks, Pat. It is a gem indeed. Great choice for Black History Month! The cover is great! I want to read more about the quilt code! Using quilts as codes is fascinating, Erik. You can find out more by clicking the Citizenship and Immigration Canada link in my post, if you like. Thanks, Erik! You are so right, Julie. And YAY, your comment posted! What a beautifully unique book! Wow! i love the idea of weaving quilts and poems and stories all together. Thanks for sharing this one! Thanks, Rhythm! It is indeed both beautiful and unique. What an interesting sounding book in a different kind of format! Love the accompanying quilt patterns, and the idea that quilts can tell stories. Great choice! I’m going to have to find this one! Hope you like it, Susanna! I’m quite sure you will! I met Cynthia Grady at a regional SCBWI event and bought a copy of this book. It is so beautiful — both in the writing and the illustrations! And a perfect book to share in February…. Ooh, Kerry — lucky you to meet her! Glad to have your endorsement of the book, as well! Thanks!